Chef Tony Maws is a strong believer in the concept of terroir, that certain sense of place which makes many great foods great. Can a restaurant have terroir too? Who’s to say? But any visitor to Kirkland Tap & Trotter will take a quick look around the room — with its exposed brick walls and old ceiling beams — and quickly realize that this location has some stories to tell. For 37 years, 425 Washington Street in Somerville was home to the legendary Kirkland Cafe — occasionally also known as Studley’s — a truly local bar owned by Ellie & Joe Hernon and beloved by residents in the neighborhood. From its early days in the 1970’s, the owners were seemingly never content to run a just a plain old bar. They sponsored bike races from The Kirkland, around Fresh Pond and back. They held peanut rolling contests. The bar was home to one of the original six teams of the Minute Man Dart League, which today oversees hundreds of teams. It was a venue where up-and-coming bands could always get a chance to play, thanks to the inclusive ethos of Mickey Bliss, who booked and promoted shows at The Kirkland for years and would regularly MC them as well, shirtless, wailing on his Hammond B-3 organ, along with the legendary Mickey Bliss Organ Combo. Chef Maws’ own brother Alex Maws, now of the band The President Lincoln, was one of those aspiring artists who performed here on a few occasions, and helped to populate the often “intimate” audiences on quite a few more. But the drunkenness, the small audiences, the seemingly random collection of unknown bands who might appear on a bill, were all part of the charm of The Kirkland. Aaron Tap recalls a gig that his band Betty Goo played to a handful of people… “Then, on comes some band whose name I never understood, a punk band from, I think, Portugal, or Paraguay, and they TORE THE PLACE UP! The singer walking around the room on tabletops, the band just killing. Loud, fast, but also weirdly genial.” Just another night at The Kirkland. The Kirkland Cafe closed its doors in 2007, and the music has dispersed elsewhere around town. 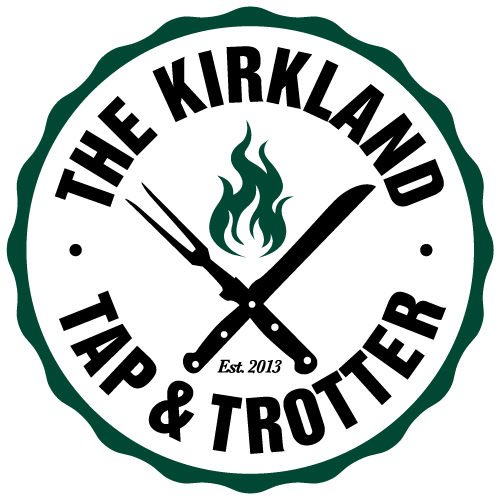 The Kirkland Tap & Trotter can’t attempt to recreate the tradition that was left behind, but we love a great dive bar and we love live music. So we hope that those influences are still here in some cosmic way, that they are in the terroir of the place. We hope that visiting this space will bring as much enjoyment to our guests as The Kirkland Cafe did to its regulars, just in a different way. Bottoms up!